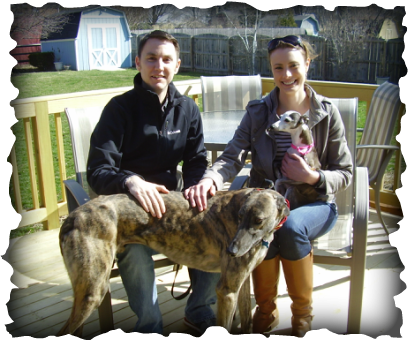 Sarah and Chris of Dayton decided it was time to find a mellow friend for their little Italian Greyhound Maggie. After meeting a couple of our available boys, Maggie picked SH Limitless who turned out to be a perfect fit. Now named Luka, he was curious but gentle with Maggie, so she quickly relaxed around him (after she first explained that SHE was in charge). Sarah and Chris are already smitten with their new boy. They had done their research and made a good choice, so we anticipate many happy times ahead for this new foursome.